Ok so here is another card before I leave for camp. I will try to get one more up tomorrow but I am not sure that will happen. My girls are really excited. If the other girls are half as excited it will be a very fun trip. So now for the card. 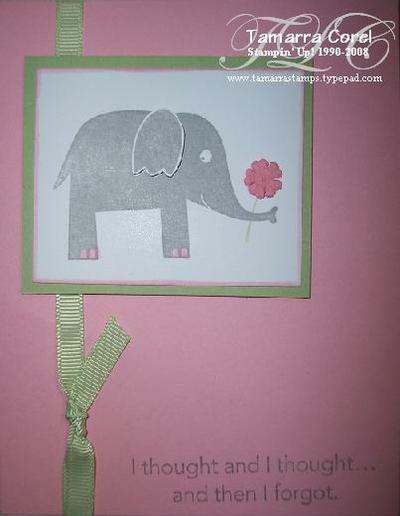 It is made with all Stampin' Up! supplies except for the safety pin. I got the layout idea form a swap I received at the Anaheim regional. Accessories: Scallop circle punch, 1/16 circle punch, 1 3/8 circle punch, Purely Pomegranate Double stitched Ribbon and a safety Pin. Ok I know some of you are thinking, "YES". Well, I am aware that I have been MIA from stamping for about 2 weeks and I am trying to get it all going again. SO I made up about 15 to catch up on belated birthdays and for my Pajama Club Ladies (Speaking of which have you all received your orders?) And hopefully after I get back from Girl Scout camp this weekend I will get some more scrapbook pages up. It will be a sneak peak for my Scrapbook Groups for this month but oh well. Not sure why but for some odd reason I like elephants. Especially the cute ones like the baby one at the Schönbrunn Zoo in Austria. When we went there was a baby elephant that was only a few months old. I think I have more pictures of that baby elephant then the rest of the zoo. When I saw the Wild about You stamp set I knew I needed it. And I have used the elephant out of the set more then any other stamp in the set. Ok, ok I know get on to the card..... 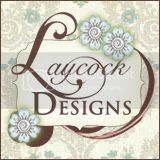 It is all made with Stampin' Up! except for the little flower. 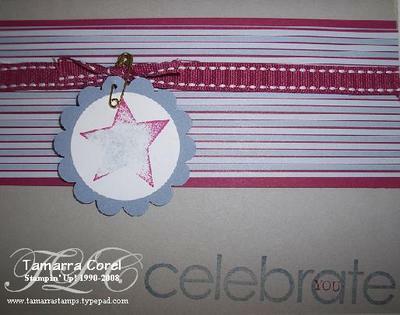 Accessories: Dimensionals, Celery Grosgrain and a little pink Prima. Abandonment??? Nope I'm still here! 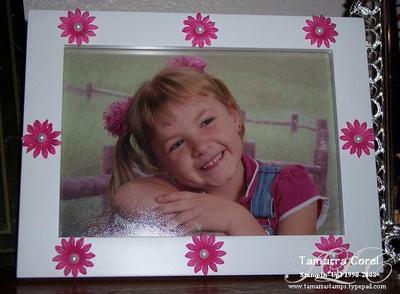 So what to do when you can't find the perfect frame for you daughters pictures? Raid your stamp stuff. I got this frame from Target for something else but it was too white. KWIM? The picture I got it for looked like I used White Out on the edges. But I figured I would give it another try with my daughters birthday pictures. Well it still looked really white but much better then before. So here is where the real raiding comes in. You know that Pretties Kit that you have stashed in your stamp room for a "special" project? Well, I have one too....LOL. Actually I am on my 2nd one but I still tend to save it for the perfect thing. Same with my Prima's and you saw how many of them I have in an earlier post. So I decided that my daughters birthday pictures were that "Special" project. Pink Prima's: April Daisies from the Flowers of the month collection. Half Pearls: Stampin' Up! 's Pretties Kit. It is all put together using the Mini Glue Dots. Now it's not perfect but it works for what I wanted and if I later decide I don't like it, I can take it apart. The picture here is a bit off in color but the important thing is my daughter thinks she is super special because as she tells everyone, "Look my mommy made me special in my special frame".